Onyeabo Azubuike Ihejirika was born on February 13, 1956 in Ovim, Isuikwuato Local Government Area, Abia State. He commissioned into the army on December 17, 1977 as a member of the Nigerian Defence Academy 18th regular combatant course. Prior to being appointed COAS, he was the Chief of Defence Logistics at Defence Headquarters. He was also the former GOC of 81 Division at Lagos, and a former Director of Engineering at Defence Headquarters. 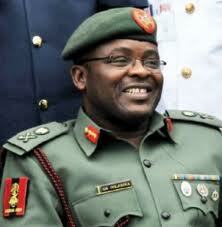 Major-General Ihejirika was born on February 13, 1956 and was commissioned in the army on December 17, 1977. A fellow of Nigeria Institute of Quantity Surveyors, he was the Chief of Defence Logistic, Defence Headquarters before he assumed his new position as Chief of Army Staff.